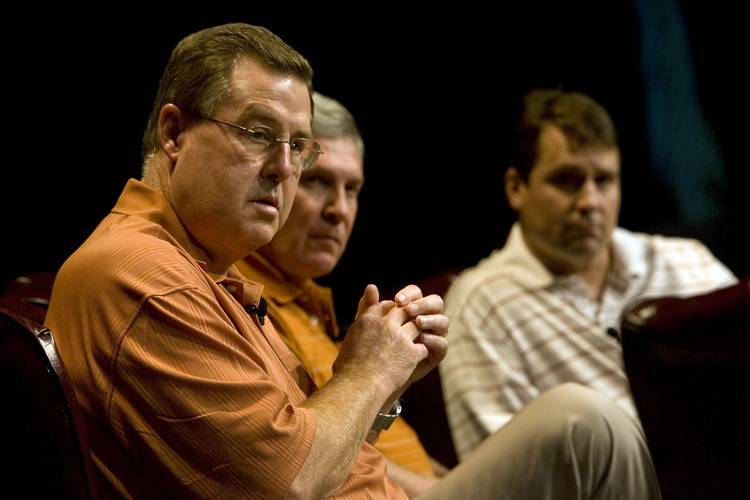 Former Longhorn offensive coordinator Greg Davis was paid to consult with Tom Herman and his staff this year. Westlake coach Todd Dodge sent Davis tapes of quarterback Sam Ehlinger as a high school sophomore. Davis, who retired after 2016 as Iowa's offensive coordinator, has also worked with Major Applewhite at Houston. He thinks back, reflecting on his 13 seasons at Texas, and finally says he has two favorite Texas-OU football moments. Greg Davis won’t ever forget Major Applewhite’s 97-yard touchdown pass to Wane McGarity out of his own end zone in 1998. “That was special,” Mack Brown’s longtime offensive coordinator said this week. Then there was the diminutive Hodges Mitchell going for two bills with 204 yards on 30 carries against the Sooners in 1999. “We were able to dominate the line of scrimmage,” Davis said. But he couldn’t leave out the day Jordan Shipley went wild, catching something like 11 balls and returning a kickoff for a game-altering touchdown to help Texas down Oklahoma 45-35 in 2008. That was one of six UT wins in Davis’ 13 games versus the Sooners. Oh, the memories flood back for the 67-year-old Davis, even as time slips away. He hasn’t been with the Longhorns since 2010. But he still has a connection with Texas and with this year’s Longhorns-Sooners extravaganza as well. Texas coach Tom Herman hired Davis as a paid consultant this season, mining his expertise for a week during training camp in August and again the week of the regular-season matchup with the Sooners. Davis has also worked for Applewhite’s Houston Cougars both this season and last and has observed maybe 25 practices this fall. He’s talked to Applewhite frequently since the Cougars’ loss to Memphis last week and kidded him that “it’s not a good thing to get your starting quarterback hurt.” Davis has been totally impressed with junior D’Eriq King, who was lost for the season the week before with a knee injury. Davis is impressed with Murray, but he is equally impressed with Sam Ehlinger. And has been for at least five years. Westlake’s Todd Dodge, a former Longhorn quarterback himself, sent Davis tapes of the current Longhorn quarterback when Ehlinger was just a precocious high school sophomore and Davis was still working as Iowa’s offensive coordinator. Davis has also worked with coaching staffs at Iowa State, Florida and North Dakota State. And he loved his time with Herman. He sat in on offensive staff meetings. He watched the two-minute drill and answered Herman’s questions about the use of timeouts. He helped the staff brainstorm about situational football. Like the Horns having the ball on their own 2, facing fourth down with a one-point lead and four seconds to play. Do you throw it deep out of the shotgun or do you trust the punter? In an hourlong conversation, Davis constantly devalued his input and any significant contributions, but when pressed, he did mention Texas switching from its usual weak-side post route on a flood route play to a back-side square-in. The play worked twice against OU in October, and Herman thanked him in a postgame text. This grandpa is rooting for the Longhorns, especially in such a rivalry game filled with so many special memories, not that they all worked. He does recalled an OU moment when the Longhorns had worked on a trick play all season and unveiled it in the Cotton Bowl. And what did Mack say after the Miller drop? “He didn’t say anything you could print,” Davis said.